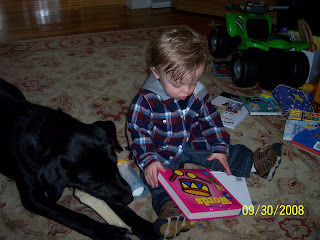 This cute photo sent to us by the owners of Tipper, formerly Tippy, was titled Book, bottle and a bone. The very nice note accompanying the photo said "Just wanted to let you know that Tipper is doing great. We love love love love love her. She has a lot of energy that is for sure and she gets herself into some trouble/mischief on occassion :) But she is great with our son Liam and a part of our family."